The San Francisco waterfront was still gray from the early-morning summer fog. For the second time in two weeks I’d visited this very spot with my camera. The waterfront seemed different on this day. 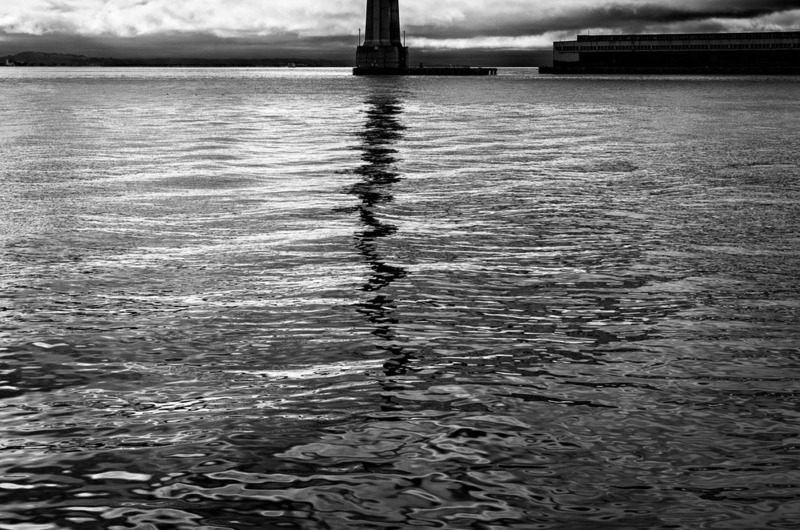 As I looked deep into the bay, the reflections danced with a darkness that I found compelling. Mostly amorphous, they changed as we came up adjacent to the San Francisco Bay Bridge. These long, linear reflections made me stop in my tracks. The bridge has become familiar after ten thousand visits to this waterfront, seaming nothing like it did the first time I laid eyes on it some thirty years ago. Back then the sight of the bridge made me gasp, now it brought a faint smile and a deep breath of gratitude. The reflection of the bridge was different on this day but I didn’t know why. It seemed deeper, wiser—maybe even sadder. I pointed my camera towards both bridge and reflection, arguing to myself which should be framed more prominently. I decided in favor of the reflection. The breeze picked up, energized by the burning off of the fog. The sun poked through for a moment and brightened the reflection. Then the fog asserted itself again and blocked the sun. The reflection grew darker again, dancing to its own song of the wind. I stared into it now forgetting that my camera was attached to me. The water lapped the pier upon which I stood, further drawing me into the spell of the bridge’s reflection. The sun burst through the white clouds again. And then once again the swirling white obfuscated it. The reflection changed for that brief moment of brightness. Specular glimmers added a strange, false gaiety to it. But then it returned to its brooding dance. Shaking myself clear of my trance, I lumbered my way to the end of the pier. There was nothing else to find there that morning so I turned around and walked back. The fog was now burning off for good. The dark reflection was now gone and so too was my inspiration. The morning had transformed itself into something else and I was ready to go home.